So I went to the new flagship Apple Store in San Francisco this morning, for a special press event in advance of its Saturday grand opening. It's a beautiful store in an appealing location -- across the street from the Virgin Megastore (motto: Overpriced CDs Aplenty!) and nestled right between Market Street and the shopping-mad Union Square district. 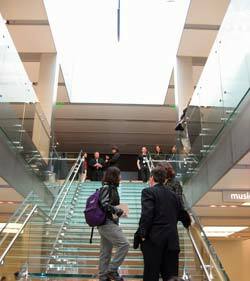 Located in the former location of the Sephora cosmetics store, the new Apple Store is a two-story structure with a glass front, huge glass skylight, and large glass staircase. Today was a mixed day weather-wise -- rain, sunshine, even hail -- but when the sun did manage to break through the clouds, the store filled with lots of natural light. Another cute feature of the store is its second-floor Internet Cafe, stocked with iMacs attached to a high-speed Internet connection. The idea behind the Internet Cafe is to take those people who might come into the store to surf the Web at a Mac designed to showcase producs, and give them a place all their own. Using the Internet Cafe is free, and since each iMac in the Cafe is attached to an iSight camera, even long-distance teleconferencing will apparently be encouraged. Ron Johnson, Apple's Senior VP of Retail, gave a brief presentation to kick off the event, and he dropped several very interesting tidbits about Apple's retail operations as a whole. The item I found the most interesting was that roughly half of the Macs Apple sells at the Apple Store go to first-time Mac buyers. Apple still contends that the Apple Stores are a long-term strategy to attract Windows users to the Mac side, and apparently it's having at least some success. 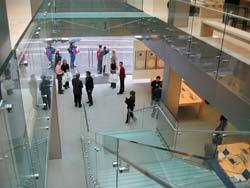 Think about it: the existence of Apple Stores keeps Apple in the minds of people who might otherwise write the company's computers off as being irrelevant in a Windows-centric world. The presence of all those related products, both software and peripherals, proves that the general perception that there are no Mac products is also wrong. And the crowds inside the story disprove the lie that simply everyone uses a PC. Once you've broken through those attitudes, buying a Mac for the first time becomes a lot less scary. And when you throw in that the Apple Store employees will configure your new computer and other peripherals for you before you leave the store, it's a done deal. The other tidbit from Johnson that struck me was that one-seventh of Apple's current revenues come from Apple's retail stores. That's a really good number, especially for a company that hasn't been in the retail business very long. Like a lot of people, I was initially skeptical about the Apple Store retail strategy. I'm not as skeptical now. I've seen the foot traffic in these stores. They really draw people in, be it for an iPod or an iMac. And as all Mac users know, the more time you spend with Apple's products, the more you realize how much better they are than what the other 95 percent are using. But the most intriguing wrinkle in the opening of the San Francisco Apple Store is what Apple is calling the Lucky Bag. 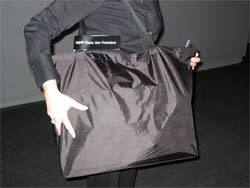 The Lucky Bag is a mysterious bag full of seven or eight products, all but one of them from Apple. Those products have a combined retail value of between $600 and $1000. But if you're one of the hearty souls who lines up early Saturday morning to be among the first to enter Apple's San Francisco store, you will have the opportunity to purchase -- while supplies last! -- a Lucky Bag for $250. What's in the bag? Apple refused to say, worrying that media wags like me might "spoil the surprise." Smart folks. But we media types are curious people. We demanded to see a Lucky Bag. We asked probing questions. One woman (okay, it was Macworld Senior Editor Terri Stone) asked if she could shake the bag -- a time-worn Christmas tradition in many homes. No, senior Apple officials said, you can not shake the Lucky Bag. If you want to shake one, be at One Stockton Street, San Francisco, on Saturday morning. I'm just guessing here, but you might want to line up early.